Cyclops there. Cyclops there. Cyclops there... Oh, my holy crap! Surveillance doe's. I hate those. 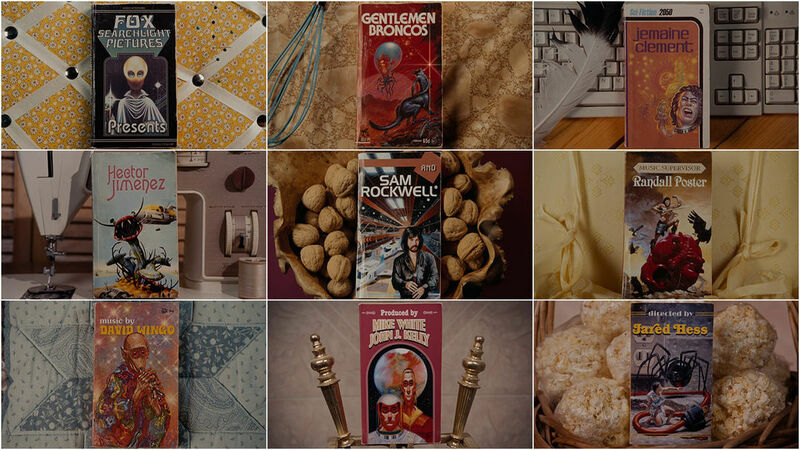 'Classic' science fiction illustrations repurposed as faux forgotten novels, exhibited on sentimental backgrounds, color each credit for the opening title sequence of Jared Hess' very funny Gentlemen Broncos. We had the opportunity to speak with Hess about his films and their unique openings. Our interview continues next week with musings on his feature film debut, Napoleon Dynamite. 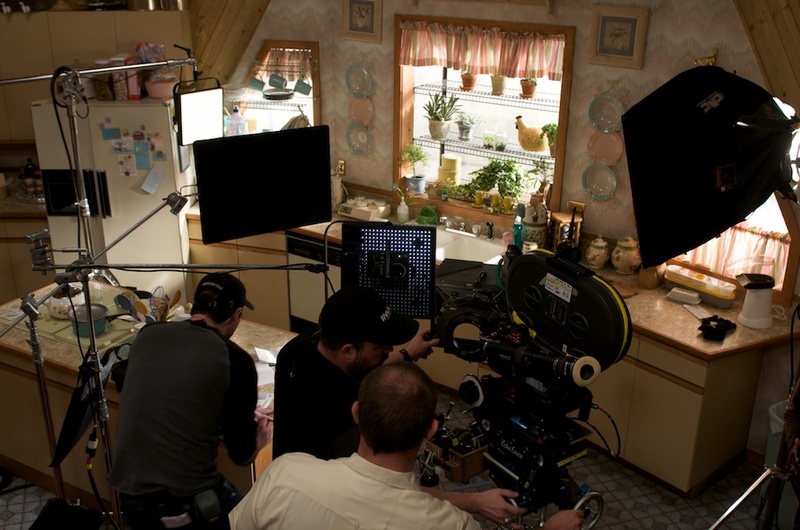 A discussion with Director JARED HESS, with additional notes from Production Designer RICHARD A. WRIGHT. Tell us about your initial ideas for this sequence. JH: We had the idea when we wrote the screenplay that we wanted the opening credits sequence to be a bunch of science fiction book covers where the credits were embedded in place of the book titles. While we were shooting the film, my production designer, Richard Wright, and people on the production side were going through existing artwork to see what was available. The idea was to scan and tweak them and then print up new book covers and shoot them at the end of production. We were first looking for stuff that looked right and helped set the tone but we quickly learned that it was going to be difficult to clear the rights since a lot were part of family estates. 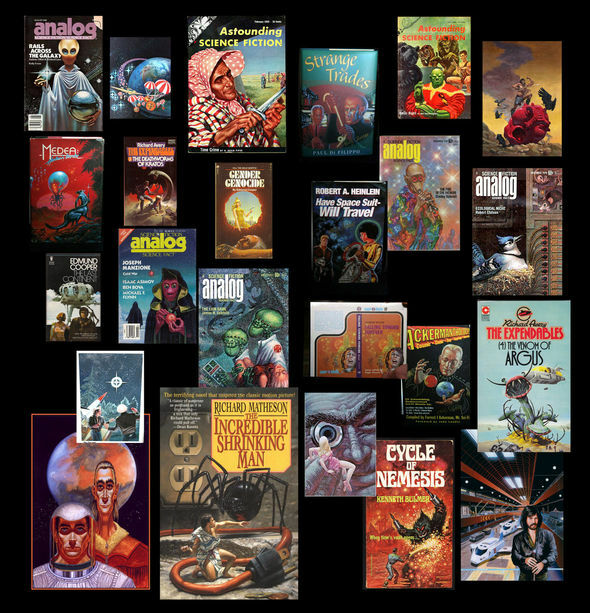 Luckily the artwork that I liked the most was from a guy named Kelly Freas and they were able to contact his wife – he had passed away – so most of the artwork in the title sequence is stuff he had drawn for different science fiction journals as well as books. What was weird was that a couple of the characters he'd drawn looked liked the people in our film, like Jemaine's book. The one we have for Sam Rockwell (a piece by David Lee Anderson) also bears a striking resemblance. It was kind of uncanny. So what was your approach to directing? How much planning and storyboarding did you do? Once you get the paperwork back from legal regarding the billing order, you can then start to piece together what you're shooting. We looked at the book designs and just tried to be smart in choosing the images, deciding what's coming before and after, trying to make things work when they’re cut together. Off the cuff, we walked around one of our sets, knowing what the covers were, looking for the right backgrounds to showcase some variety; these were just static shots. We were very freeform and in the moment, and we spent a day shooting, just like the Napoleon opening. I mean, for Broncos, we had all the books printed up and then went and shot them in the kitchen and living room set of the geodesic dome that Benjamin and his mother live in. We showed up at 7 a.m. and said, "This book looks good here, let's shoot it right here," or, “It looks good against this background or couch,” and we would shoot multiple takes not knowing what would work when it was finally cut together. We gave ourselves a little wiggle room. Towards the end it felt like we shot every good background – really stretching our resources. 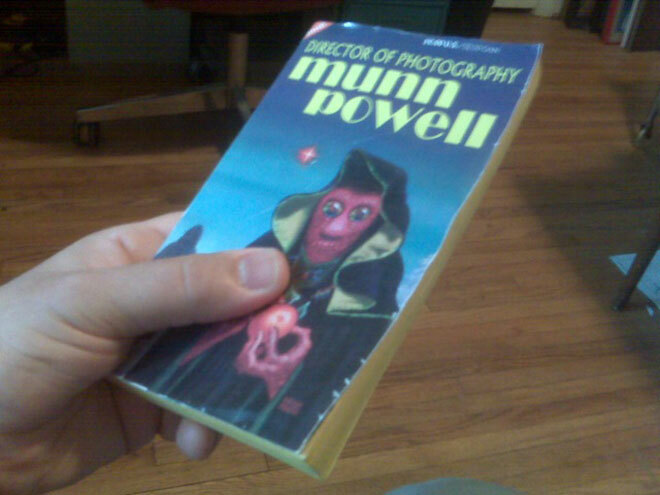 It also helps that the book covers look real. The legal department at Fox – because of the different guilds – were really trying to push us to use the same font for everybody and we thought that was lame. We assured them that everything would be the same size and take up the same amount of space on screen, but we had to use different fonts, obviously. We did end up using the same font for the "Written By" and "Directed by" text because of worries from the legal department. It's weird, dude. Hess and I drew a lot of inspiration for the sci-fi aspects of the film from old paperback sci-fi book covers that we would file through in used bookstores. Many obscure titles from the ’60s and ’80s have amazingly creative art; some brilliant, some really dumb, but funny dumb. I started buying all my favorites to decorate the office and use as reference. I could usually buy a dozen for a couple bucks. I think that one day, while admiring some of the weirder covers, Hess decided that it would make a nice title sequence. 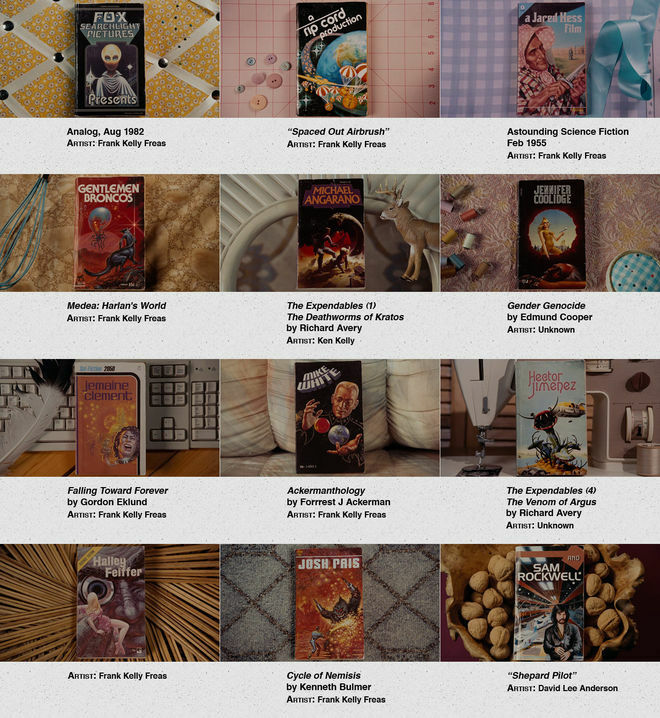 So, over the course of filming, with the help of the producer's assistant David Dilley, I scoured bookstores and the internet to figure out who had painted our favorites, which was not such an easy task. The majority of the art was not attributed to anyone and many of the publishers of the books were either out of business or had been gobbled up by larger mega-publishers over the years. The majority of the titles we managed to obtain for use are painted by the great illustrator Kelly Freas. We wanted the books to look as authentic as possible, so we spent several weeks trying out different fonts and layouts. I was able to convince my friend, Peter Sattler, a very talented former graphic designer – who played a big part in the creation of this title sequence – to head up the layout of graphics, etc. Then we applied all the final book covers to actual books and aged them to look the same as they do in those dusty Salt Lake City second hand bookshops. Most of the art chosen for the covers either has some vague representation or relation to what the credited person's role was with regard to the film or has a slight resemblance to the people themselves. It seemed appropriate to film the books in Benjamin Purvis' house. It was a nice way to introduce the viewer to the bizarre contrast of Judith's pastel, crafty, wholesome home and Ben's uncomfortably weird sci-fi imagination that was nurtured within it. And the music just hit the nail on the head. It's a catchy tune with a dated sound about the far-out future. The lyrics are pretty amazing: "Magic pills and judgment day"... Benjamin could have written them himself. Have you ever had an idea for a title sequence but the technology isn't quite there yet eg., retro 3D? JH: I really haven't...I guess I think a little more lo-fi than that. I think that most of the title work that interests me is stuff you have to photograph, and those have been the ones I've always enjoyed, like the opening sequence to To Kill A Mockingbird. There is a manifesto-like quality to your sequences where the emphasis is on humor; where does that come from? The three films I've done so far are comedies and to me it's important to let the audience know right away that things are going to be silly, and any way that can be done to convey that – making sure to set the tone of the film with the title sequence – is important to me. As far as the comedy, some of the stuff we found for the book covers wasn't even really sci-fi related, especially the card I picked for myself that says, "A Jared Hess Film" – it has an old dude in a pioneer bonnet sharpening a knife. That was the weirdest thing and Kelly Freas had all kinds of junk like that, and it kinda blew my mind. How did you start out as a filmmaker? I come from a big Mormon family of six boys and was always making really lame karate movies on the trampoline with my brothers. Later on I actually started interning as a camera assistant with a cinematographer my mom had gone to high school with. So every summer from the time I was 14 I would work as a camera assistant, like as a camera loader, on whatever he was working on, whether it was a commercial or documentaries or small feature films, so I had a little production experience before I went to college. At film school I thought I wanted to be a DP for a while so I actually shot a lot of student films. I really didn't like what I was working on though and thought a lot were just a lame waste of film, so I decided that I needed to write my own comedies. That's when I shot Peluca, which is the short film that inspired Napoleon. It's on the DVD and you can see how poorly it’s exposed – it's grainier than all get-out. That was the foray into filmmaking. For Nacho, I'd been a big fan of the lucha libre masked hero wrestling films and after Napoleon we learned about a Mexican friar who was moonlighting as a wrestler to raise money for an orphanage. It was a property that Paramount had bought and we got to go write it with our friend Mike White, and luckily I was already a big fan of that world. 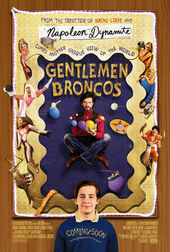 So much of Broncos is autobiographical. I mean, the mother character is very similar to my own mother, who made popcorn balls and would make me and my brothers go sell them and she also worked for a modest nightgown company. My wife has a cousin who lives up in Alaska, he's 15, and for a long time he'd been writing really messed up science fiction stories that bring his mother to tears all the time. We read a couple of them and they were... I mean I could really relate to this kid in a weird way, and we just thought it would be a good jumping-off point – the story of a misunderstood artist, trying to do stuff that he was passionate about. How much of the way you work is self-taught versus film school training? I've always wondered how real directors do it. I’m definitely self-taught. My wife and I have co-written all of our films and I feel like the writing process is already a bit of a direction – when we're writing characters and voices and things it's always been an important part of the process for us to know exactly what these people look like, what they wear, and how they sound. I do a lot of line readings when I'm directing, doing all the voices of all the characters in our films, and I'm fortunate enough to work with people that don't completely hate me for that. Immediate family. I really do take my cues from life and I guess I'm really mining people that I know. Most of the characters that populate our films are loosely based on people that we know now or people we grew up with because so many of them have such fascinating or interesting stories, whatever quiet life they lead. I want this type of personality to be exposed to other people. Most filmmakers try to make the kind of movie they have wanted to see but haven't seen yet, so they're going out and making it. It can be very selfish, and you can end up alienating people. Do you see yourself going more mainstream then? Yeah, I mean, there are plenty of stories that I want to do that I know I'd have to do in a studio way, to be able to do it bigger, and that stuff excites me. Napoleon and Bronco were smaller stories about smaller characters and needed to be done that way. I think it would be just as fun making something bigger, though Nacho was big for us. For me though, I want to make a western. I can't wait to make my western.